Shruti G. Math Post Graduate Scholar, Dept. of Prasooti Tantra & Stree Roga, Sri Kalabyraveshwara Swamy Ayurvedic Medical College, Hospital & Research Centre, Bangalore, INDIA. Papiya Jana Professor, Dept. of Prasooti Tantra & Stree Roga, Sri Kalabyraveshwara Swamy Ayurvedic Medical College, Hospital & Research Centre, Bangalore, INDIA. Hyper emesis gravidarum is a rare obstetrical problem with incidence of 2 to 3% of pregnant women experience deliveries. Various demographic factors have been hypothesized as contributing facors for hyper emesis gravidarum. These include occupational status, maternal age, parity and inter pregnancy interval. Hyperemesisi gravidarum is because of result of an adaptation to the hormonal milieu. Although studies have identified many adverse pregnancy outcome such as low birth weight, intra uterine growth retardation etc. In this study Bilwadi Lehyam with Pathya Ahara has been evaluated for its efficacy in the management of Garbhini Chardi. MATH, Shruti G.; JANA, Papiya. A CASE STUDY ON AYURVEDIC MANAGEMENT OF GARBHINI CHARDI W.S.R. TO HYPEREMESIS GRAVIDARUM. 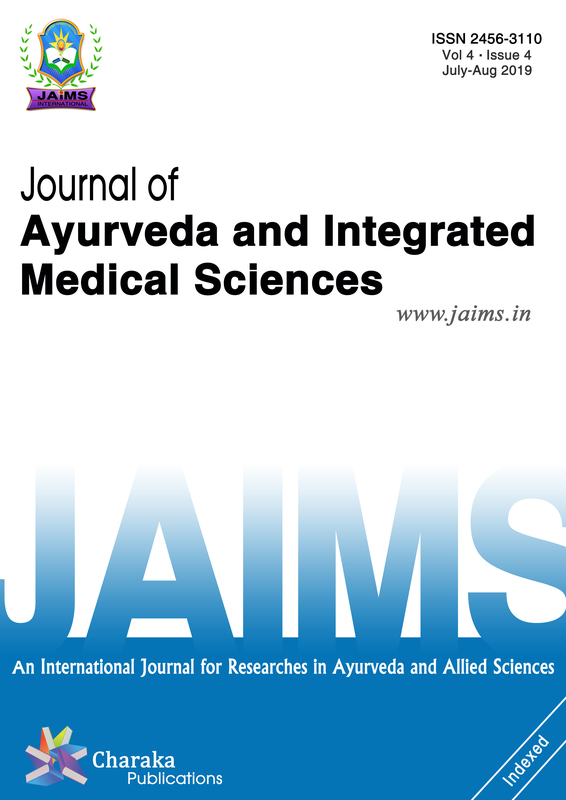 Journal of Ayurveda and Integrated Medical Sciences (ISSN 2456-3110), http://www.jaims.in/index.php/jaims/pages/view/Citation, v. 4, n. 1, p. 102 - 105, mar. 2019. ISSN 2456-3110. Available at: <https://jaims.in/index.php/jaims/article/view/778>. Date accessed: 25 apr. 2019. doi: https://doi.org/10.21760/jaims.4.1.21.